Minimalist design for more clarity – a bundle of flat design graphics. A bundle of seven flat design products that contains several slide collections on the topic of office, metaphors, mobile devices, long shadow design, people silhouettes and tools in addition to the standard template. Flat design deliberately avoids textures and plasticity and instead incorporates typography and hierarchy of sizes and colors. Rather than sophisticated lighting effects and elaborate reflections, simple shapes and clear color contrasts are preferred. The result is a design concept that is reduced to the essentials, therefore making it clear and easy to use. This idea originated in web design because current websites or apps must work to conserve resources and be flexible to be displayed and used optimally on different devices such as smartphones, tablets, laptops or flat screens. The flexible design idea also makes this design for PowerPoint fitting. Graphics of simple shapes and color contrasts can be used in different contexts. They not only facilitate an overview but can also direct the audience's attention in a particular direction. Therefore, our collection of flat design elements offers graphics on various topics such as office, metaphors, mobile devices or workshop utensils. 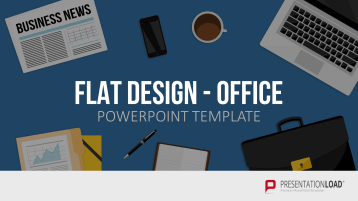 Whether with a laptop, envelope, calculator or notepad, this slide set will allow you to present your daily office routine with graphics in flat design. Take advantage of our selection of ready-made office graphics or create your own presentation by using our toolbox of various office supplies. Metaphors are used to bring a situation or idea clearly to the point. This is true for literature as well as the design field. 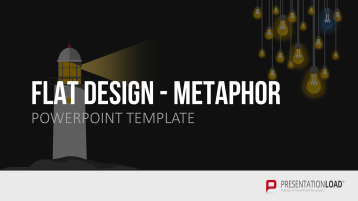 This toolbox includes flat design graphics for displaying various metaphors, including a light bulb for representing an idea, an octopus with eight arms symbolizing multitasking or a scale that draws attention to a fine balance between various alternatives. 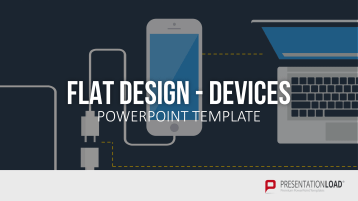 Utilize flat design graphics of different mobile devices such as tablets, laptops or smartphones to design your PowerPoint slides. Flat design elements that cast a long shadow are aptly called long shadow design. This concept is suitable for displaying keywords and short headlines. In addition to shadows, color contrasts and font selection can contribute to drawing attention to the selected keywords. 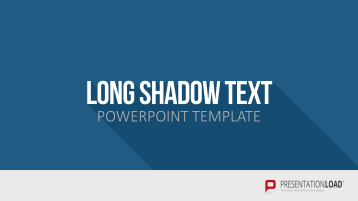 This package includes a collection of different templates in long shadow design. This bundle contains human and animal silhouettes in flat design. Each graphic represents a particular situation or emotion. For example, a joyous man or a poised woman, a band at a performance or craftsmen at work as well as figures of different animals. Included are graphics of tools, small machines and other items needed for a well-stocked workshop in flat design for PowerPoint. Create your own digital toolbox by integrating brushes and rulers, calculators and angle rules, screw clamps and bolt cutters or even jackhammers and chainsaws into your slides. This is a complete presentation template in flat design. Whether with dividers and tables, image placeholders and chart templates, timelines and other pattern diagrams, this template set provides the key elements of a successful PowerPoint presentation in a single package. Helped me with my presentation. Those templates are awesome! Thanks for this template! It gives my presentation the special touch! Awesome designs - very high quality!